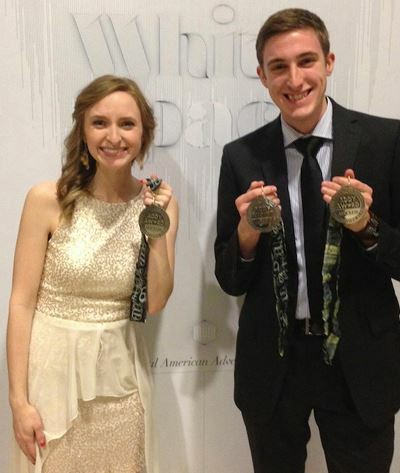 Seniors Katie Simpson and Jeff Carden show off their silver medals at the ADDY awards. In the world of advertising, anyone who is anyone knows about the American Advertising Awards or ADDY Awards. This contest is currently the industry’s largest running advertising competition and is represented by more than 50,000 entries each year in local competitions. While it starts out locally, it is run nationally, carried out by the American Advertising Federation in a three-tiered system. The first tier starts out locally, where competitors go against others that are best in their markets. After this, the local winners compete with the other winners in one of the 14 district competitions. These winners are then passed on to the third tier where they compete for a national ADDY Award. The ADDY Award is a high honor awarded only to the most skilled of designers. Two such designers happen to attend this school. Students Jeff Carden and Katie Simpson were both given this high esteem on Friday, February 21 for their winning advertisements submitted to the ADDY Awards. Both students received a silver medal for their achievements, earning them recognition for their exceptional and creative works of art. Jeff Carden, Senior Graphic Design Major with a minor in Theology and Ministry, received two ADDY’s for a couple of his class projects. One project featured an event poster for the Oklahoma City Ballet for Dracula and the other focused on a magazine series and spreadsheet that promoted awareness of mental disorders. “I was really honored to receive these awards. It will look really great on a resume and in a portfolio. Even though it is a local award, the competition is recognized on a national level as well. It is a great motivator to keep on growing and developing my graphic design skills,” said Carden. Carden is currently the Editor-in-Chief for the Arrow, the Art & Design Administrative Assistant, as well as the student representative on the Technology Advisory Board. Even though this is a competition, it supports the entire industry of advertising. Not only does this competition raise awareness of advertising but also the proceeds of this event go towards advertising for programs such as public services announcements, consumer awareness, advocacy groups and internships. Next PostIn review: Robocop, man or machine?